An Iceland Gull in Preston this afternoon, this well known individual has been around a while now. Notice it is on ice, Preston is as cold as I can remember it being in my lifetime and even by Hokkaido standards it's pretty damn cold. My journey to Preston from Japan was an unmitigated disaster. I got to Amsterdam OK but on arriving to an icebound airport it became clear something was wrong when we had to wait on the runway about 2 hours as all the landing docks were occupied by frozen planes. I disembarked in time to see my connection had been cancelled and learned I would have to spend the night on the airport. I had no change of clothes and no cash. Thousands of people were milling around, no airline staff were on view anywhere. I joined the queue for the transfer desk with the thousands of others and spent the night slumped over a baggage trolley. The next morning nothing was happening and after various rumours and wild goose chases I ended up at a gate that had a plane going to Manchester, me and hundreds of others. KLM gave priority for those with tickets for that flight and it was basically bad luck to all of the rest of us who had been waiting up to 24 hours. Things got pretty ugly at that point and the airline staff had to call security, eventually common sense prevailed and we got on the next flight. I had spent 48 hours with no sleep and no change of clothes when I finally got to Manchester to find my luggage was not there. I filled out a form and left the airport, in the chaotic scenes I didn't get a receipt and had to call later for a reference number to track my bag. KLM, the f**kwits, rather than sending my bags on the next flight to Manchester decided to send it via Paris and Bristol and 4 days later it still hasn't arrived. So I have hardly any clothes to wear and no christmas presents to give anyone. Oh and I just caught a cold too. 2010 just gets worse and worse. 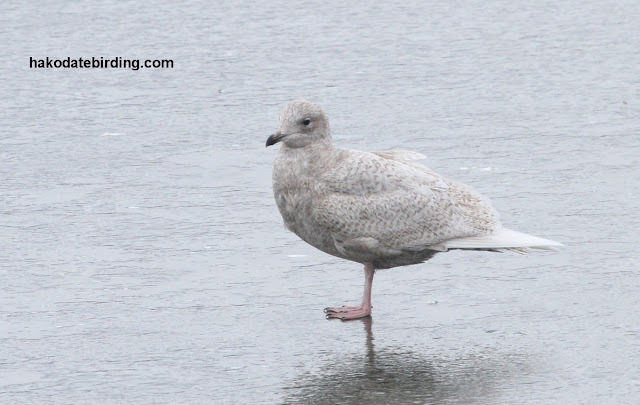 At least the Iceland Gull was still around. Oh no! I hope 2011 will make it up to you.Any way, merry Christmas my friend! Chill out - literally - and have a day in brilliant Blackpool Stu. only 8 long eared owls for you to aim your camera at today. Cheers and best wishes for the festive season. Thanks for all the comments, yes I need to chill out but I'm wound up so tight I'm ready to explode. Beer is the answer at this stage I think. "Beer - the answer" ? Works for me ! Perhaps you're lucky not to have been routed through Heathrow. Actually I physically went down to the airport and demanded they find my suitcase and lo and behold some competent staff member disappeared and 30 minutes later produced my bag! Good to be back eh Stu? Sorry we dont seem to be doing any ringing for a day or two, a Brambling would have warmed you up. An Iceland Gull is nice though. I tried looking for it while in Rausu, but couldn't find one. There were just too many gulls, I guess. By the way, Merry Christmas and Happy New Year!